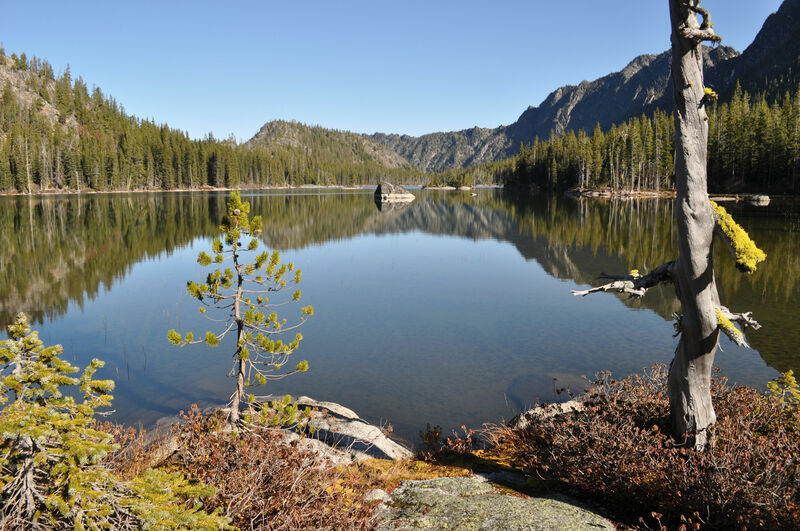 You are currently browsing the tag archive for the ‘Upper Snow Lake’ tag. Josh and I stop for a break in the neverending switchbacks at the beginning of the trail. Slopes dressed up for Autumn. I used to joke that the only reason I worked was to earn the money and vacation time I needed to get out and hike. I hiked much of the year, with multiple big trips. These days I am grateful to get out once a year. My annual hike is worth celebrating though. What joy to be on a trail again. 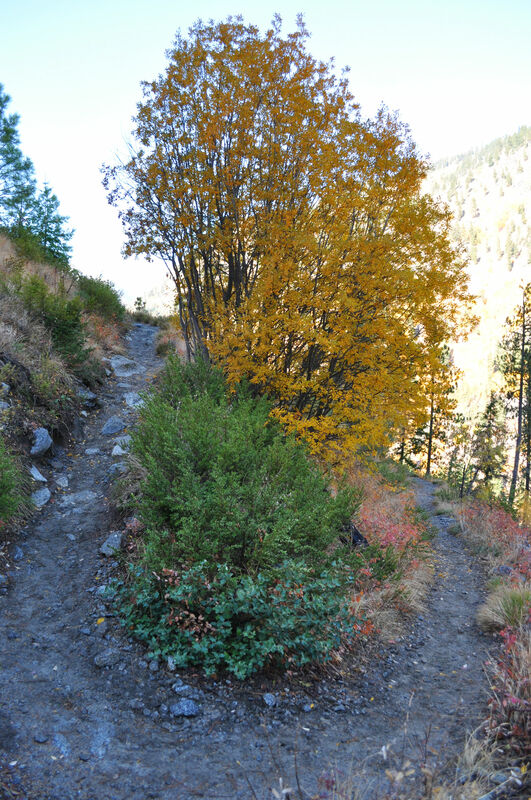 The Snow Lakes trailhead begins just outside of town on Icicle Road heading out of Leavenworth, WA. Hit the link there and just look at a couple of photos to get a sense of the town. It is totally kitschy and totally touristy but oh, so, beautiful that it’s worth every potential drawback. I reserved a room at the Leavenworth Village Inn, where I have stayed before, and was equally pleased. They offer a military discount, which I used. This lovely little Bavarian-styled town is smack in the middle of Oktoberfest. So Plan B was that if the trail was snowed out, I would drink some ale. Admit it, you love my Plan B. Prior to the trip it rained and rained and rained and then! Tuesday morning was spectacular. 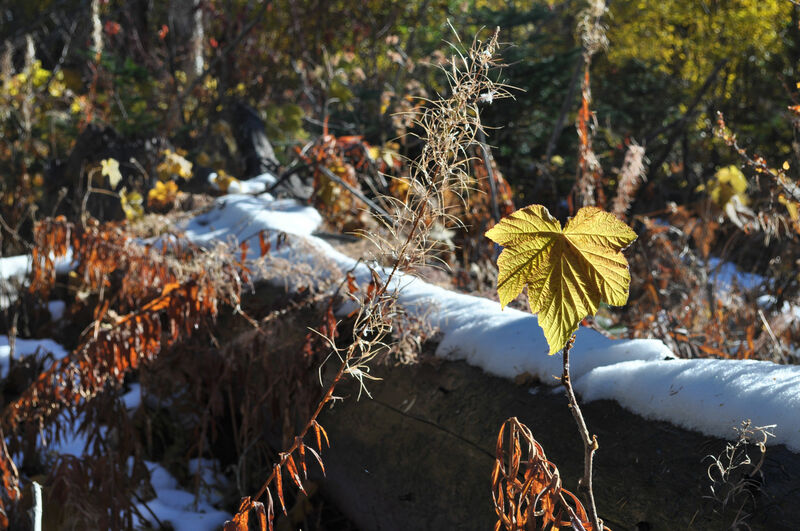 Sun lights up a lingering thimbleberry leaf. Sunrise hits the peaks over Nada Lake. Trail descriptions really downplay this part of the trail, recommending to start at the other end because there isn’t much to look at on this side. I beg to differ. It’s truly magnificent, and especially so in October, where yellow trees pour down mountain valleys like molten gold. The air was crisp and hinting at afternoon warmth. The sky blue as only October blue can be. Morning sun on Nada Lake. The sun drops early in the evening these days, but we made it to the first lake before it got dark and set up the tent while it was still light. It got really cold, really quick, and soon we escaped into the tent for shelter. Wednesday morning was beautiful and I was energized as I boiled up water for coffee and made breakfast. It was the debut of my new MSR Whisperlite stove. My old whisperlite had been a solid and reliable companion ever since I bought it in 2000. This last camping trip, when I watched the eclipse, it stopped working. I suspected the lines were clogged. Prior to this trip then, I took my little stove out on the deck and pulled it into all its pieces and began cleaning the fuel line. I went into the house to grab some steel wool for scrubbing the soot, and when I came back out I saw that a gust of wind had come up and the teeniest little stove piece had bounced away, off the deck, and likely through a crack and into the weeds underneath. I hunted on my hands and knees under the deck with the slugs and spiders that day for approximately 4 hours (remember how I said I am stubborn?). And then I went on Amazon and bought a new stove. Whatever I paid for that last one, 17 years is a good run and I did not feel bitter about the purchase of a replacement. The brand new stove worked great (of course I had tested it before we left). Here I am resting during the hike up from Nada Lake, where we camped the first night. Look at that slope! Wicked steep. Then we loaded everything up and went uphill again. This was a short hike, only a few miles and 1000 more feet. It wasn’t as pleasant as the first day because we were tired, but also because the clouds rolled in while it was still morning, and a light rain began to fall. It rained all day long, but luckily just a light rain that frizzed my hair but didn’t soak through anything. 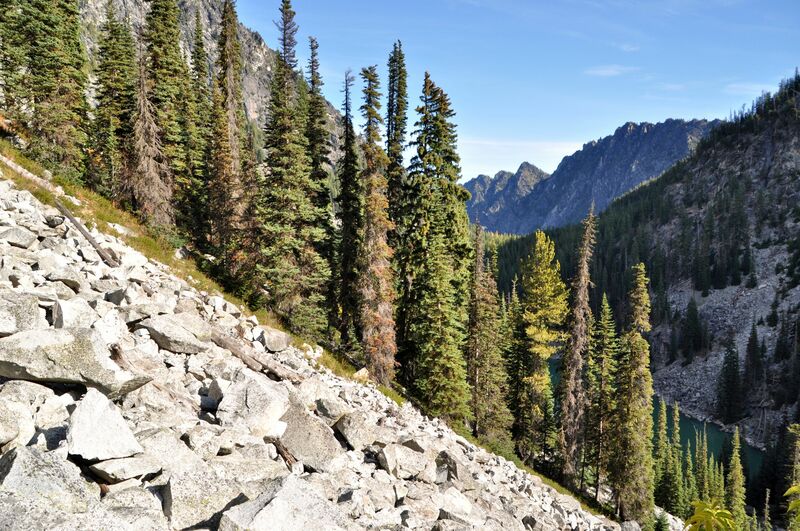 We found a spot to camp at Upper Snow Lake at about 5400′ elevation. As we were looking for a place to camp, we met two hikers that had just descended from the next lake up. They said to be sure and use our ice cleats and snowshoes because of all the ice and snow on the trail. Well, we didn’t have either. Most of my hike life I’ve been a fair-weather backpacker and only recently learned that camping is fun when it’s cold, too. But I won’t go so far as to invest in snow hiking gear. I’m not crazy. 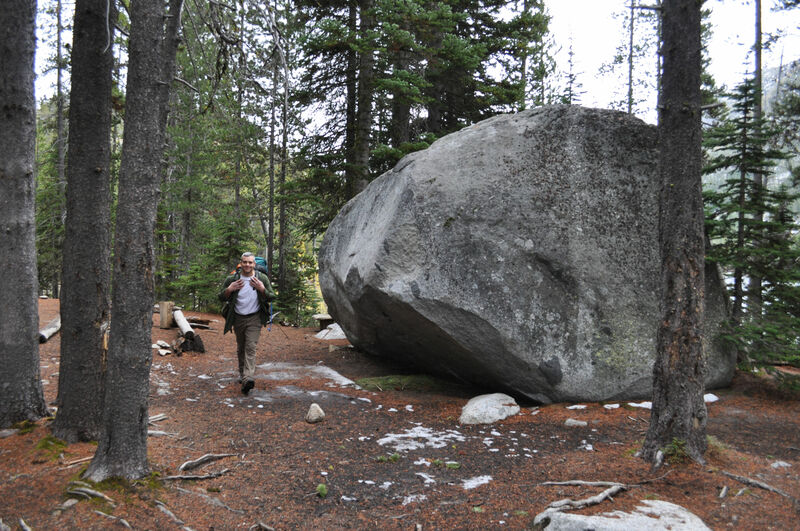 Enormous granite boulders were strewn about, making us feel small in comparison. 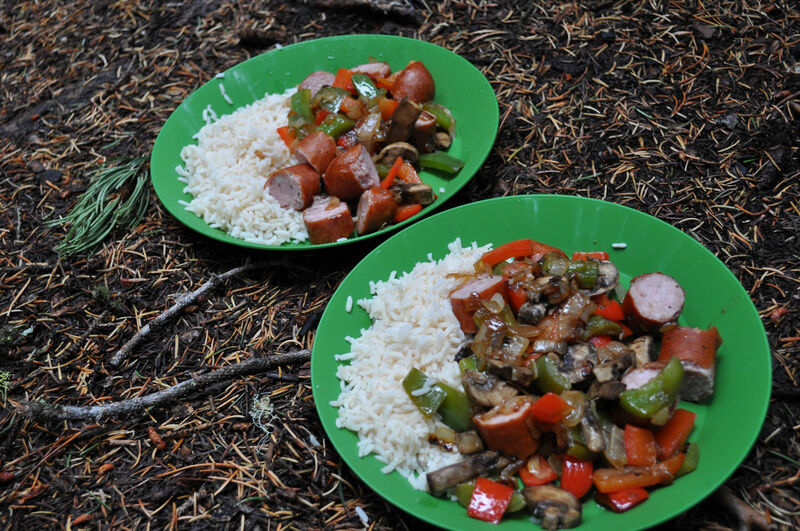 You know I love to eat good food in the mountains! We spent the remains of the day running around in the forest and climbing on rocks. You can act like you’re 10 years old when you camp in the mountains. In fact, it’s pretty much expected. It rained harder in the evening, and rained during the night. Thursday, to my delight, it dawned spectacularly clear again. It was the warmest day so far and after the fog burned off, not a cloud to be seen. We were still chilled from the wet night and took a long time to get moving. I was trying to decide whether to do a day hike up to Lake Viviane without snow climbing gear. It must have been noon before we were finally packed up. Didn’t even try to dry the tent out. Everything was just going to have to be wet. 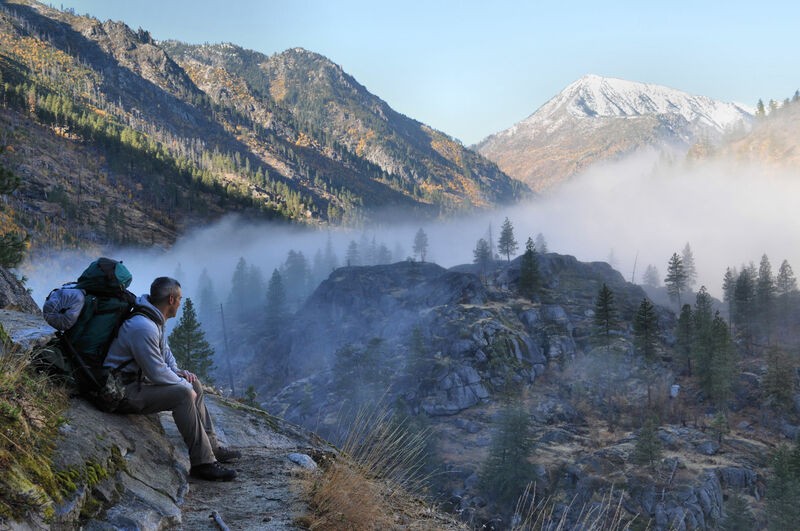 I was tired and after a tentative query to Josh, who didn’t really warm up to the idea of a few more thousand feet, I committed to heading back down the mountain. Morning on the shady side of the lake. Still trying to thaw out so I can pack up my gear. 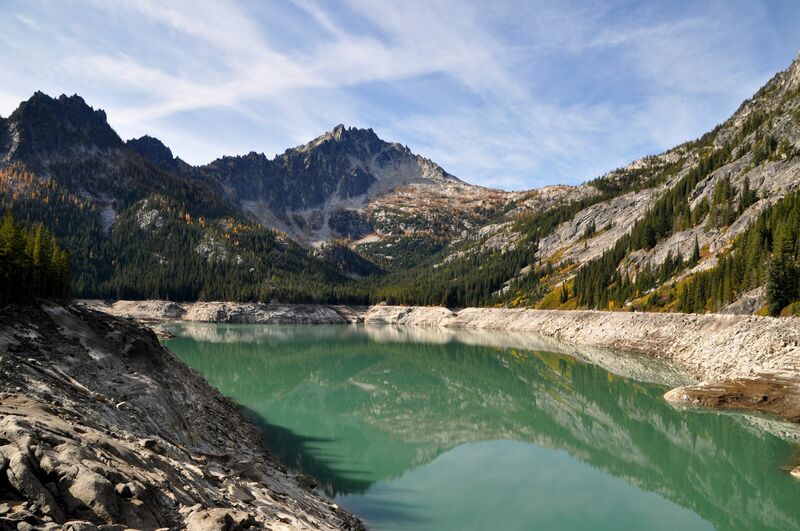 A mountain called The Temple rises above a little peninsula in Upper Snow Lake. 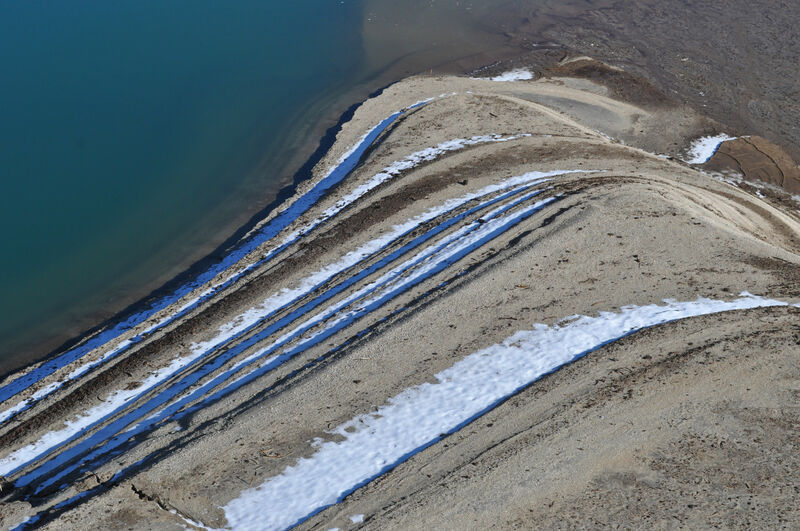 Sand formations in Upper Snow Lake, which is also a reservoir, as you may have guessed, as part of the water district for the city below. I was intrigued by the patterns and shadows in the sand. 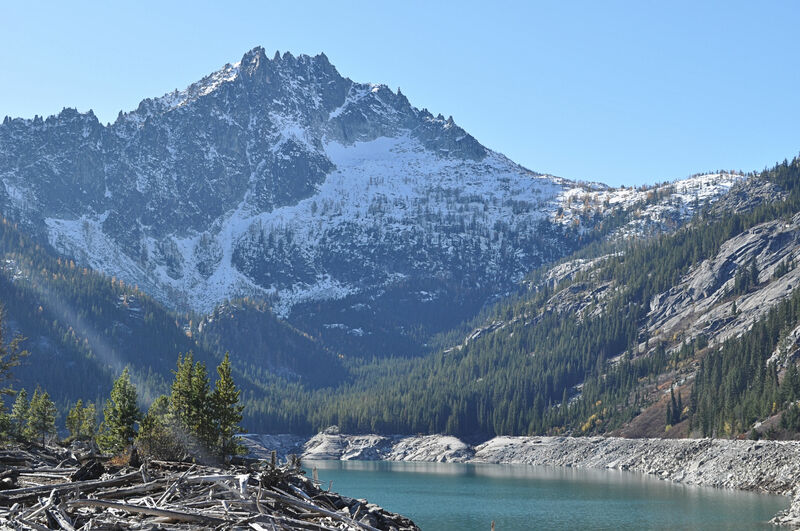 McClellan Peak commands the view of Upper Snow Lake. This was the hare’s turn to shine. After the stolid and steadfast tortoise was a clear victor in going uphill, the hare practically caught the trail on fire going back down. We went down all 4000 feet in just a few hours – a record for me. He was very patient at first, because we found a couple of places awash in sunshine and I wanted to do nothing but lounge. I wet and re-braided my ratty hair. 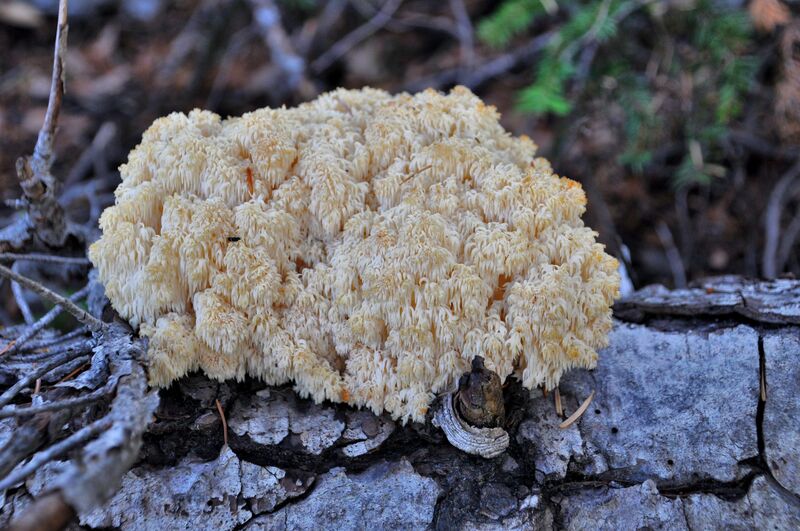 I climbed up and down hills and boulders and over logs with my camera. I snacked. I smiled. Josh laid on a rock in the sun and didn’t say a word. But when I finally gave the green light and we hefted our packs and buckled in….whoosh! He was gone. The rest of the day I barely saw my traveling companion. 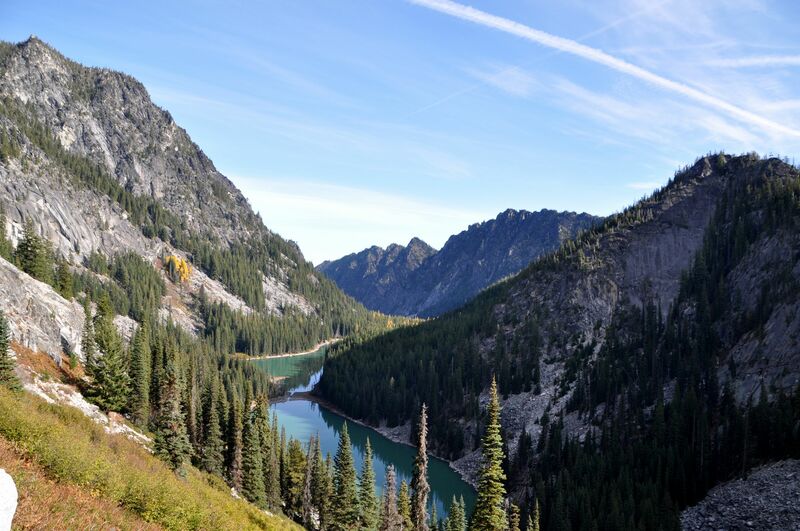 Sunshine and blue skies make a paradise at Lower Snow Lake. And hiking alone is my comfort zone, so it was no big deal. But I did get very tired. And my feet were aching. And then my knees started to hurt, and still I had not caught up. Sometimes he would spot me from hundreds of feet below and holler up, “Everything ok? You taking a nap up there or what?” I would signal a thumbs up and voom, off he’d go again. 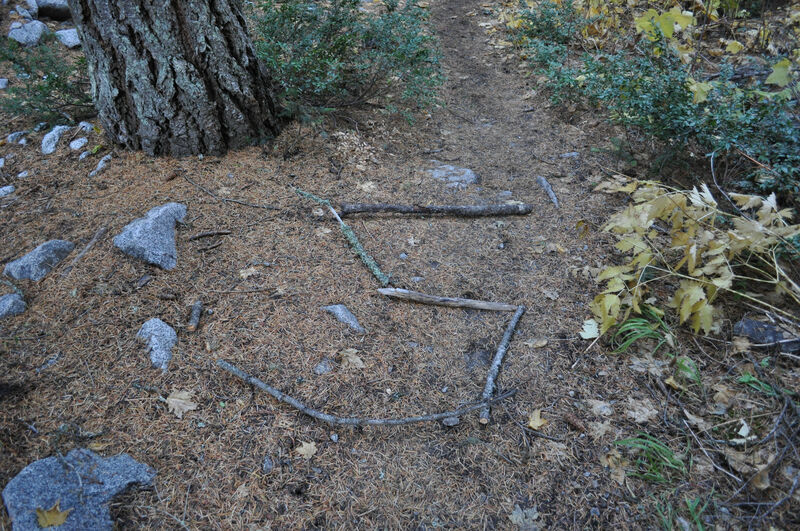 At one point as I was about to step over a pile of bark from a tree that had fallen over the trail, I noticed that some of the pieces of bark had been shaped into an arc. Only the curve was sideways, making it look like the letter “C.” And I laughed out loud. Yes, that is something he would do: leave me a message to let me know I was not forgotten. What a sweet gesture. It kept me going for another 15 minutes and then I was just about to despair in pain again, but I came across more bark that was indisputably an “R.” And that time I really laughed! That crazy guy was going to spell my whole name! Sure enough, 20 minutes later I found a “Y.” And it wasn’t until “S” that I finally had the sense to take a photo. T in red needles was my fave. Camera hanging around my neck and still I didn’t take a photo until I got to the S.
It didn’t slow him down at all. Zoom! Gone again. I found my L. And you would not believe this, but he did my last name too. 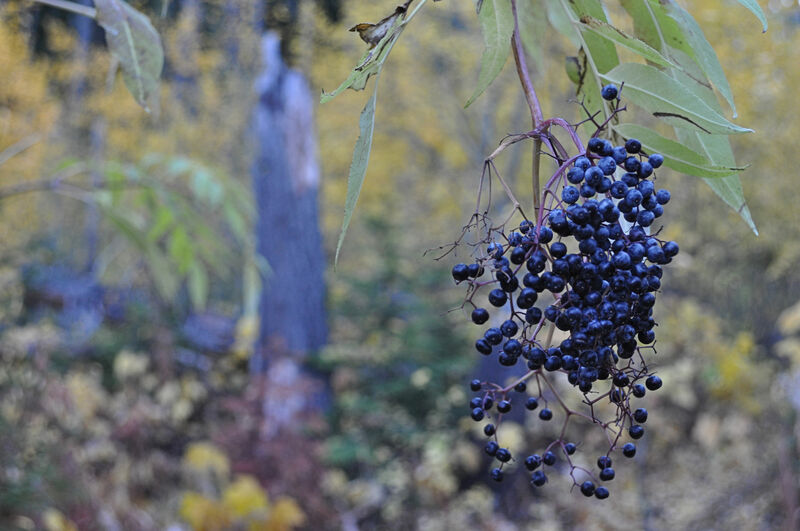 Berries hanging over the trail were begging for a photo. 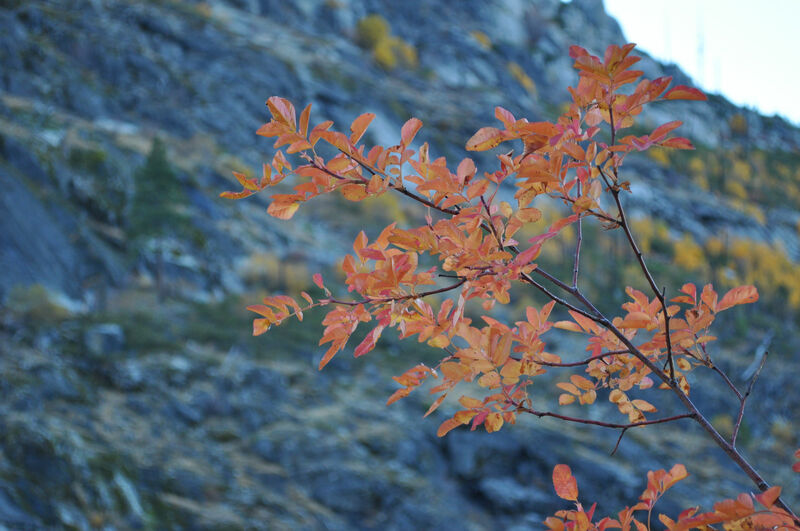 Don’t you just love the fire colours of the season? The lovely day and the lovely foliage did as much to cheer me as the letters on the trail. I kept plodding along, but tortoises apparently are not made for rapid down hill trekking with no breaks and no meals – just snacks on the go. My feet were killing me and I had to stop a lot to sit down and get the weight off my soles. Josh hit the parking lot, ditched his pack, ran back up the hill to where I was, teased me for napping, then took my pack and went back down again. It was still daylight when I finally hit bottom. Well, you know, “finally” as in finally caught up to Josh. But in terms of backpacking down a mountainside, we really smoked. I’m glad I took the chance on the late season pass. Everything worked out perfectly. It didn’t snow too much before last week, and the weather was splendid for two of the three days. On the trail is where I find my bliss. Looking down onto Nada Lake, I see the sun has finally touched the spot where my tent was. Too late Mother Nature! I got tired of waiting for you and moved on. My night was soooooo cold, even though I finally bought a new sleeping bag for this trip. I don’t have a thermometer, so I do not know the low temp. The forecast was for mid-30s, but I wouldn’t be surprised if it was in the 20s. My old sleeping bag is rated to 10 degrees Fahrenheit, but it has lost much of it’s down and warmth. It will be my summer bag now. In the morning I unzipped the tent and little snowshowers fell as ice broke from the zipper. I hopped around shivering while I made my first cup of coffee, then carried the cup back and got into the sleeping bag to read a book while I waited for it to warm up a little. After an hour, it began raining inside the tent. It wasn’t until I packed up the tent that I saw why: my body heat had caused condensation between the rain cover and the tent itself. Then, that layer of moisture had frozen into thin strips of ice all over the top of the tent! 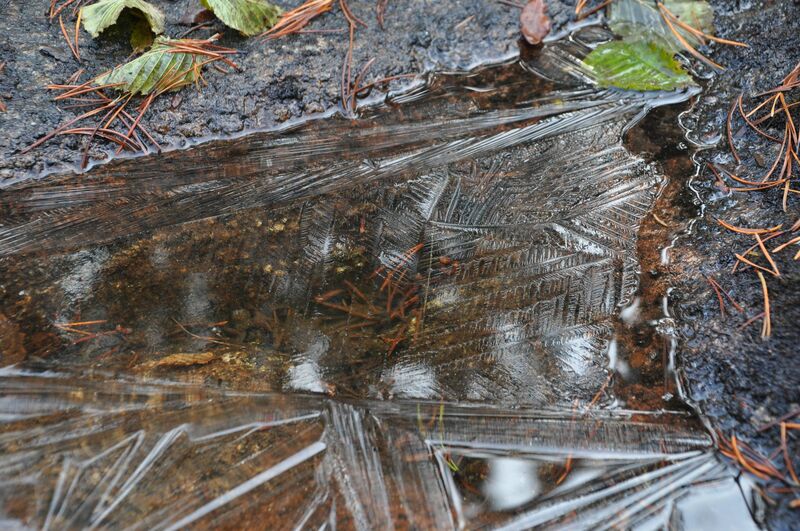 As the day warmed, the ice was melting onto me. The best way I could think to get warm was to start hiking again, so off I went, wet gear and all. Luckily there were more switchbacks right away. Ha! Who would have thought I would say “luckily there were switchbacks?” Soon I was in the sunshine and high above my little peninsula. Soon after that, I could feel my feet again. 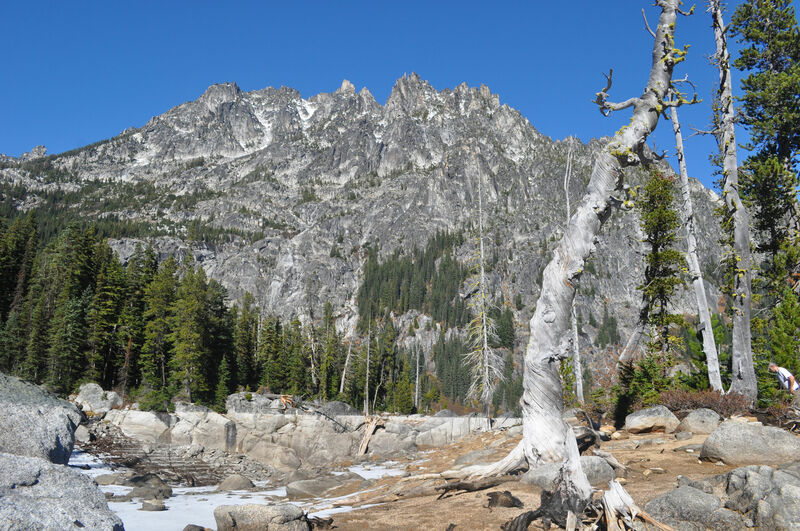 I took this picture for you: so you could see how steep the climb is between Nada Lake and the Snow Lakes. It was a climb of only 500 feet in less than two miles to reach my next camp site, so a super easy climb day for me on Wednesday. 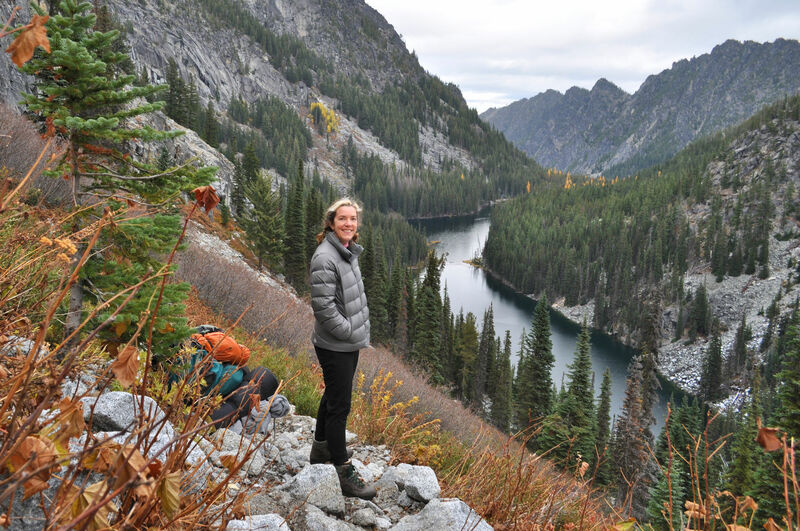 I had planned to go the extra mile (heh heh – literally and figuratively) to camp on the far end of Upper Snow Lake, which is as far as my permit would allow. 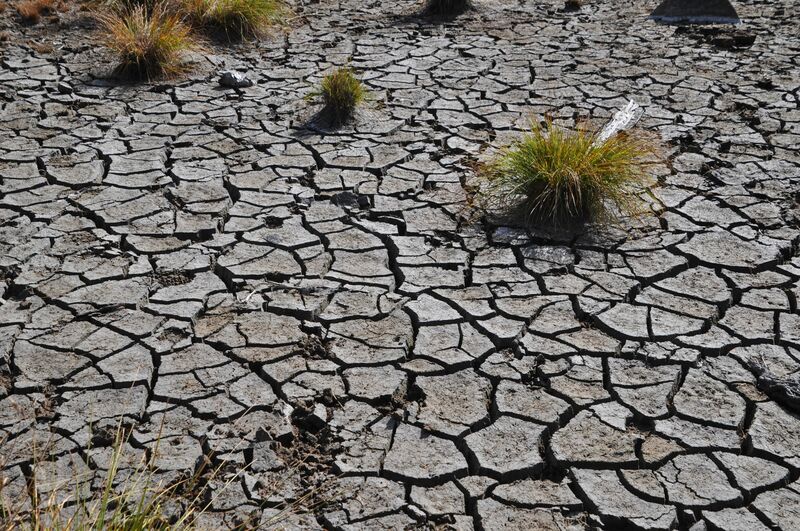 However, once I arrived at the lake, I saw that I would not be able to access the water, and I need water in camp. 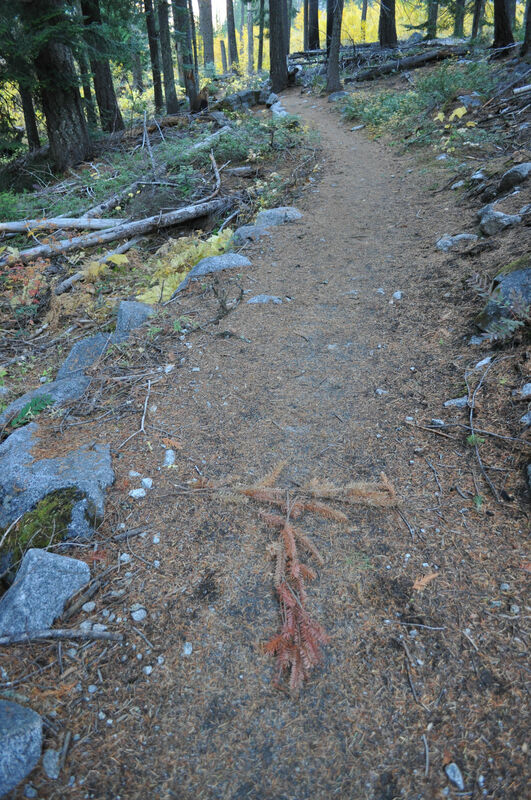 The trail reaches both the Upper and Lower Snow Lakes at the same time, as it comes out between them. I passed between the two lakes by walking on a stone wall built by the Leavenworth National Fish Hatchery. 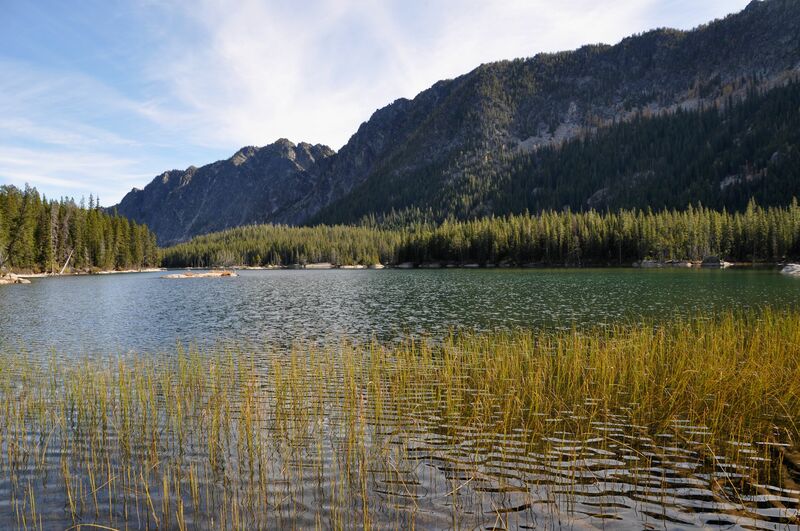 There is an aqueduct that runs underground from Upper Snow Lake into Nada Lake, and this is opened as needed. 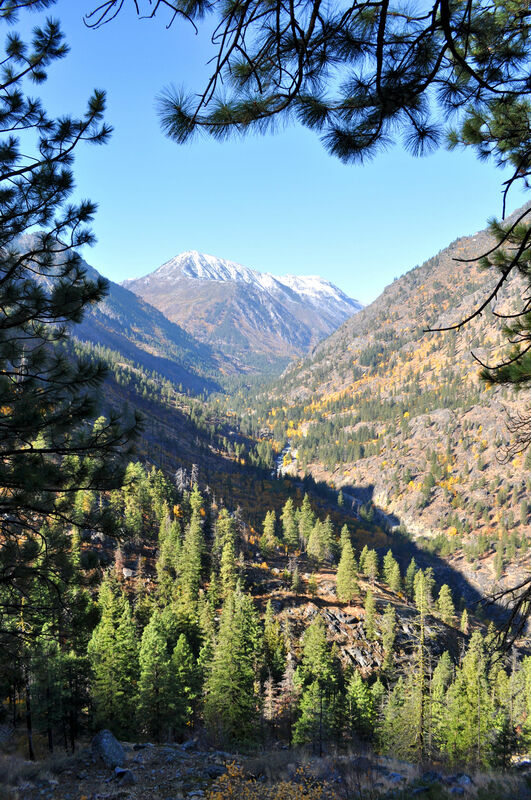 The water is used to keep the valley streams flushed with cold water in the hot summer months to keep the salmon population healthy, and is also used on crops by farmers. 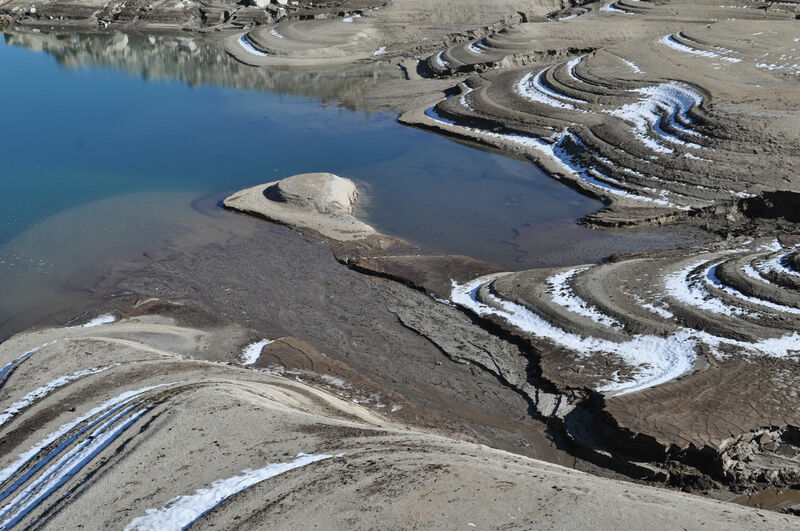 I have never seen a mountain lake drained in this way, and it’s disconcerting to see. 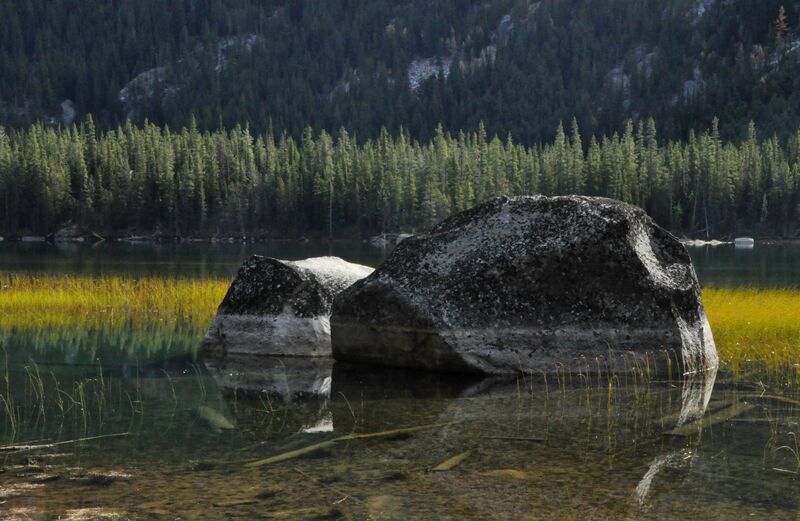 It is far too low for a human to attempt getting close enough to touch the water in Upper Snow Lake. I am curious as to whether the lake refills to the top each season, or if what I saw is the result of drought. 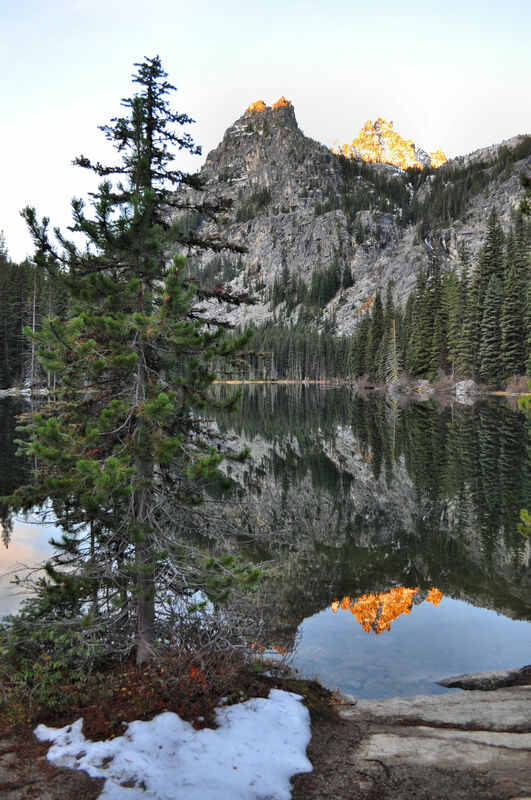 McClellan Peak rises above Upper Snow Lake. The water level is drastically diminished due to feeding the crops and salmon in the valley. 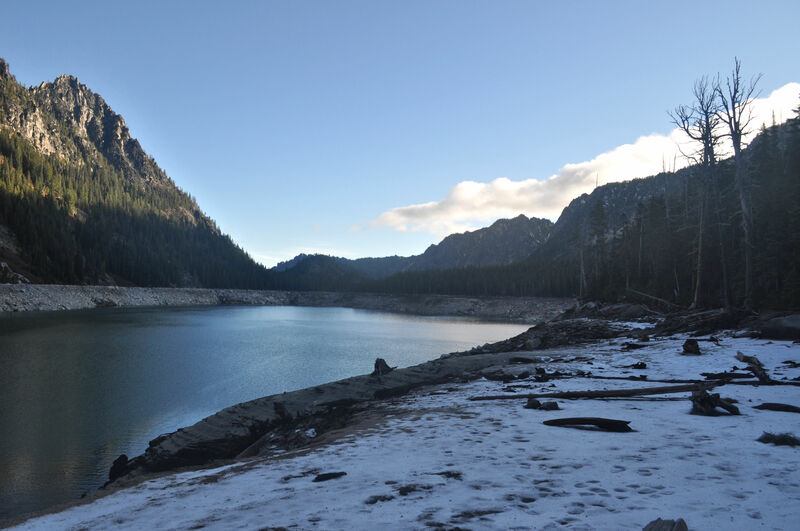 Lower Snow Lake is at normal levels, since it is not part of the Fish Hatchery system. 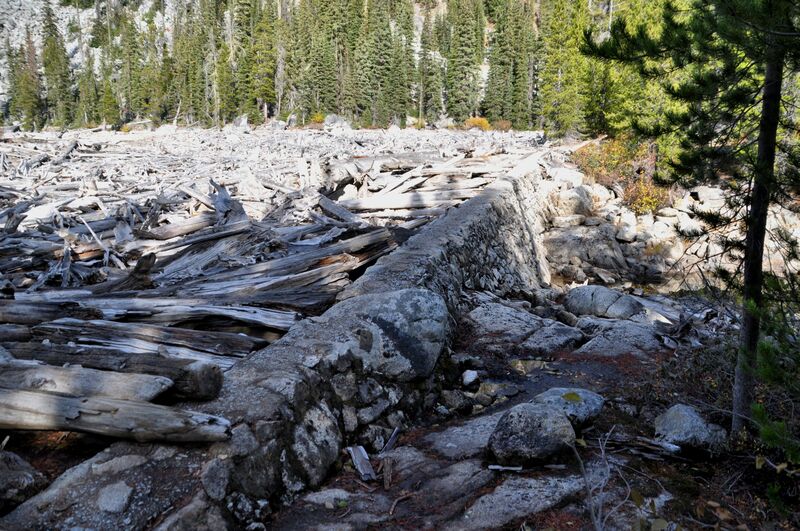 The dam between Upper and Lower Snow Lakes doubles as part of the trail. Ice beside the stone dam shows that it was still cold at the Snow Lakes. Lower Snow Lake had plenty of water, so I stopped between the two. I happily dumped my heavy pack in the shade (to keep the perishable food cold). Not quite ready to decide my campsite, I set up the tent so that the sunshine would melt the remaining ice and dry it out. Then I grabbed my camera and followed the trail to the end of the lake, looking for a campsite closer to the trail that would lead up to the higher lakes. I walked to the other side of the lake (references say it is either 1 mile or 1 1/2 miles to the end of the lake, so that gives you a sense), but found no campsites with water access. I did, however, find other things that amused me. 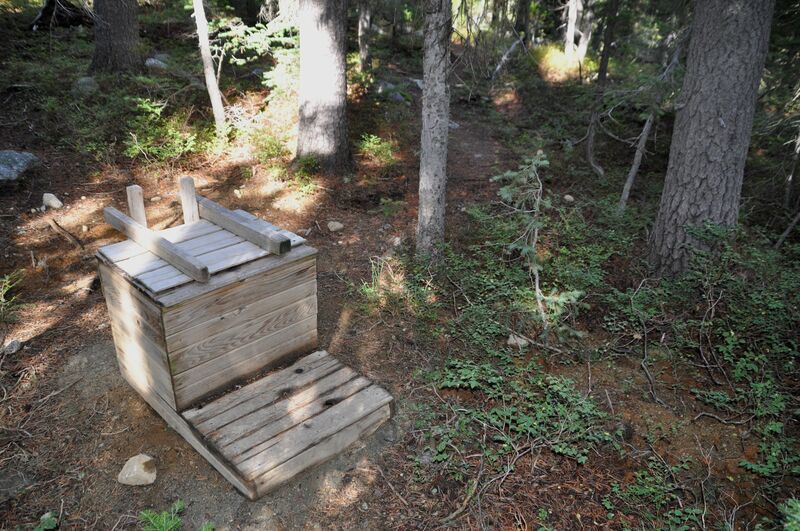 I had been passing multiple signs stating “toilet” with an arrow, and this struck me as highly unusual that someone would take the trouble to construct a toilet at 5500 feet in the mountains. I followed one of the trails and found one. A mountain toilet. You lift the lid, and sure enough there it is! I find this hilarious… though probably necessary in this very popular wilderness area that fills with inexperienced hikers every summer. 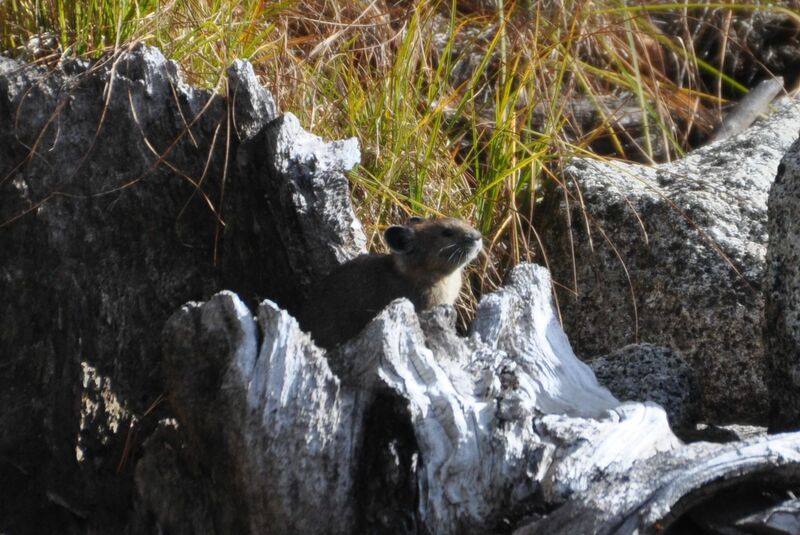 I also was delighted to see a few pikas and what is likely the first ptarmigan I have ever seen. 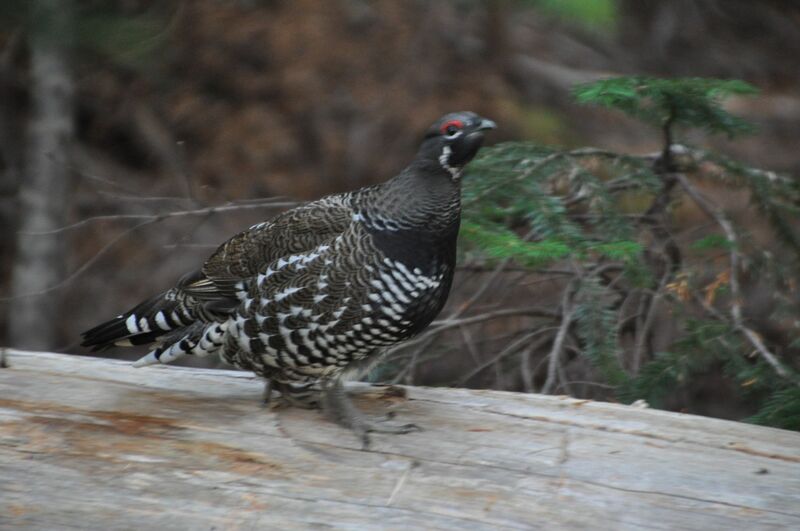 Dogs were banned from this trail in 1982 in an attempt to bring back ptarmigan populations. 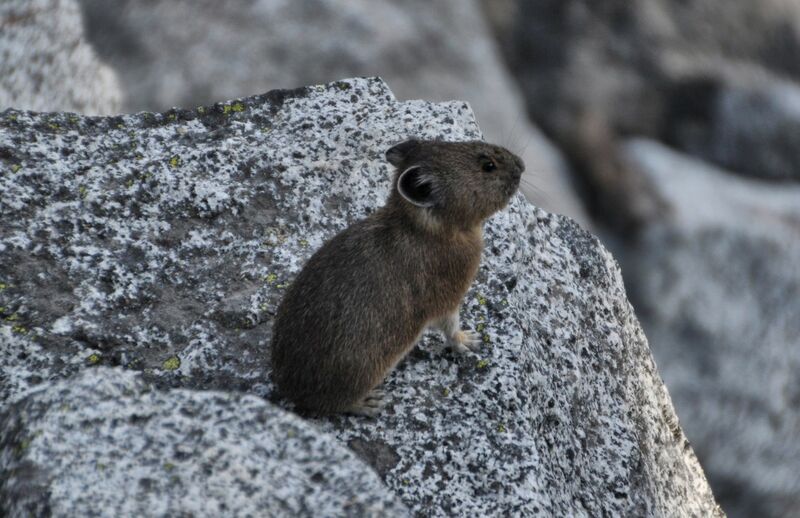 A pika holds still and poses for me. I took a dozen photos of this lovely bird. However, the light was very low and it would not hold still, so most are too blurry to use. 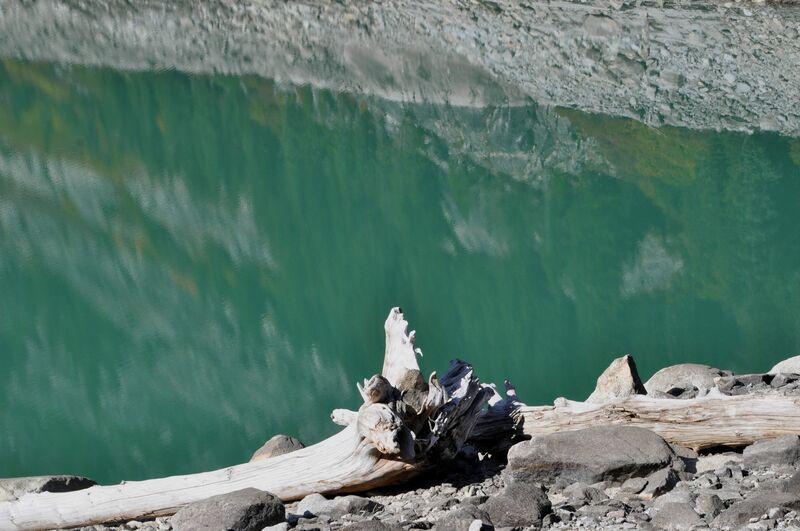 Bleached white log beside the aqua-coloured water that was continually captivating to me. The view from the far end of the lake, back toward the stone dam, near where my tent is pitched. 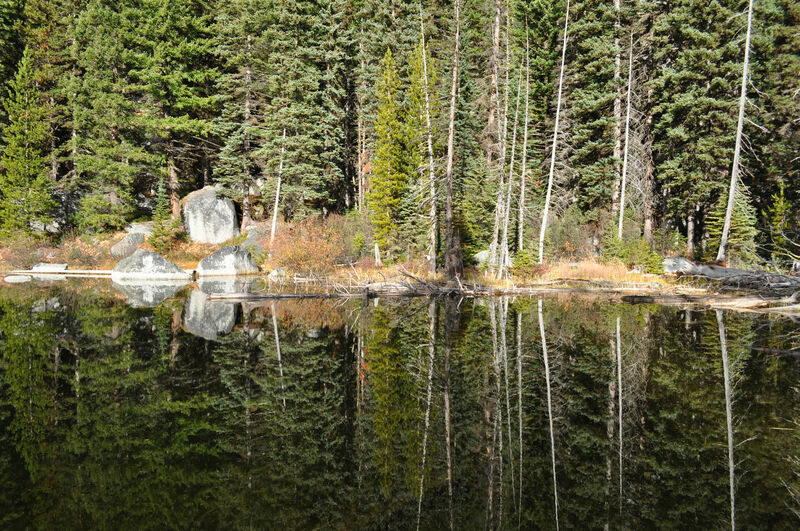 Once I decided I would have to camp back at the other end of the lake, I turned around and made the trek back to camp. I organized my gear, read more in my book, climbed around rocks and beaches, and generally enjoyed myself. 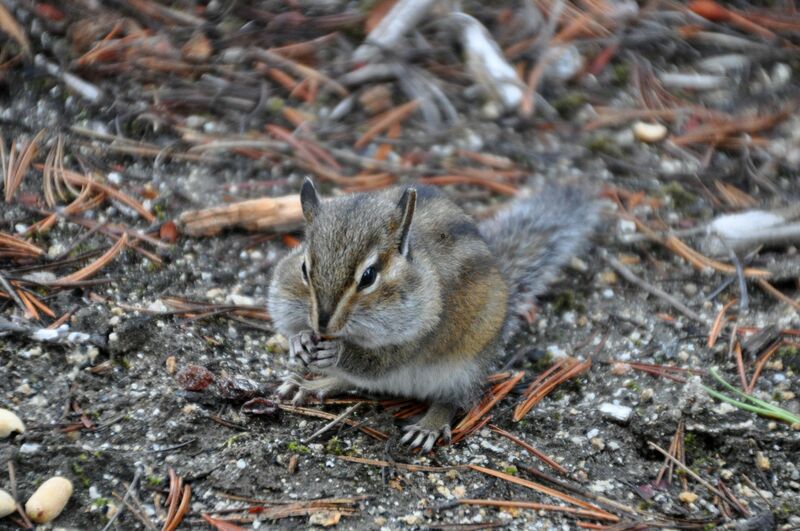 The chipmunks and whiskey jacks were distinctly interested in me, and like all the other misbehaving outdoor adventurers they had met before: I shared a few peanuts with them. Yes, do not follow my example folks. Feeding the wildlife: very bad behavior. The light makes grasses in Lower Snow Lake glow. 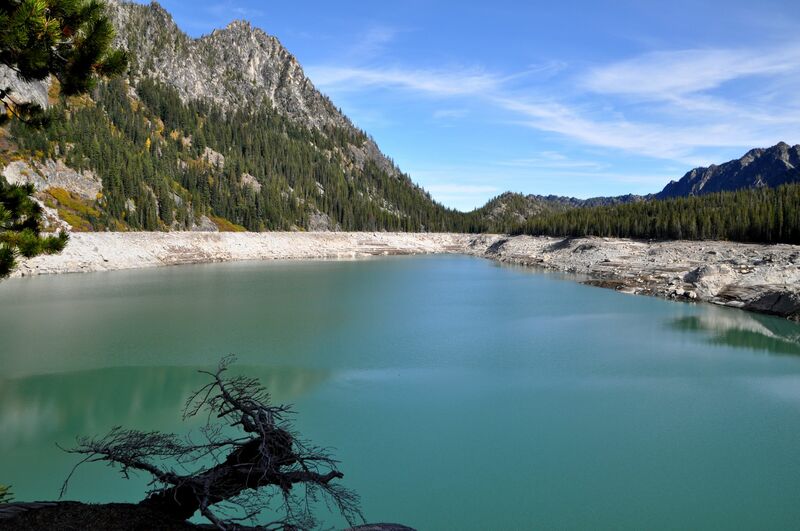 An area that would be underwater if Upper Snow Lake were properly full. The cracked mud makes interesting patterns. 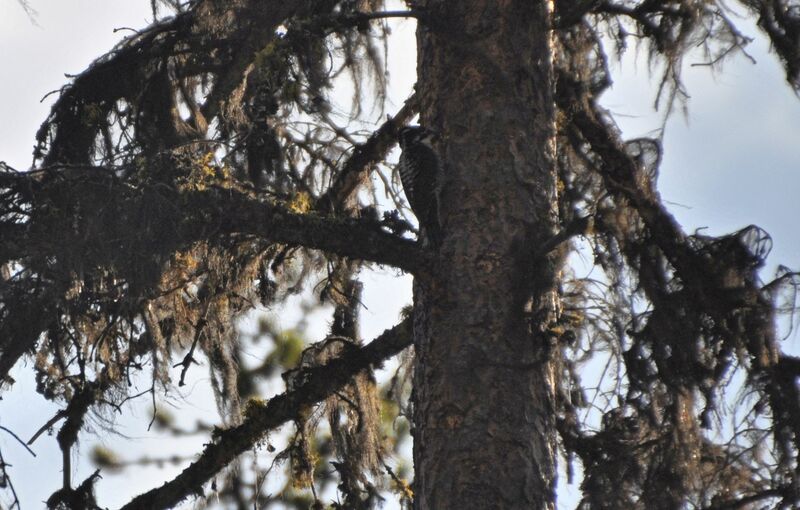 A woodpecker pecks only on the shaded side of the tree – specifically to thwart my photography efforts. 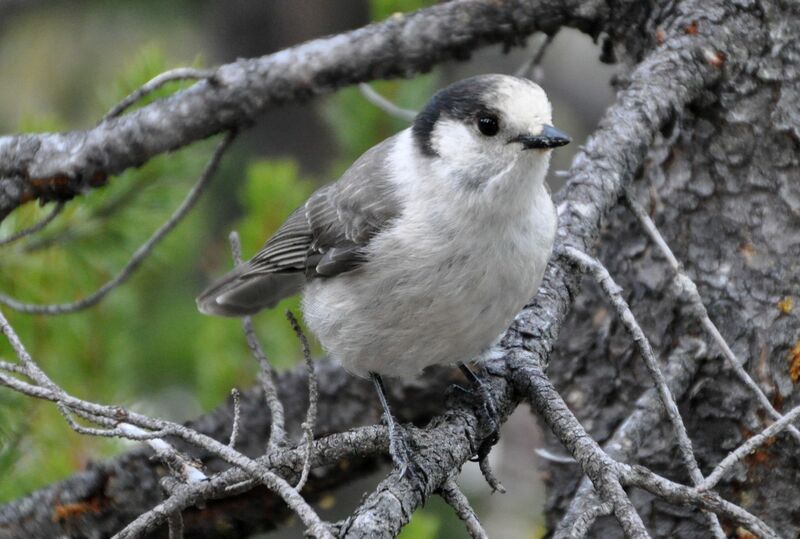 Whiskey Jack (aka Grey Jay )says, “Yo! Toss me something good to eat, lady!” When I didn’t, he hopped all around me as I sat on a rock, eyeing my clothing for crumbs. The chipmunks and whiskey jacks mounted a joint attack force and my resistance was futile. I shared my peanuts to their great appreciation.